Plot: In his fifth year at Hogwarts, Harry is under pressure as the Ministry of Magic refuses to acknowledge the return of the evil Lord Voldemort branding him a liar. Meanwhile a delightfully evil new Defense Against the Dark Arts teacher is appointed by the Ministry and she turns Hogwarts into her own military state. 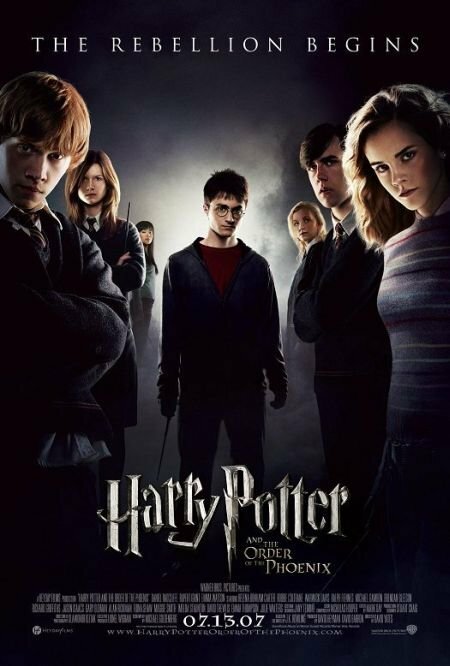 One Of The Weaker Entries Order Of The Phoenix is still a pretty entertaining film on its own, But after how damn good Azkaban and Goblet were, It�s slightly underwhelming, But of course that doesn�t ruin the fun The Wizarding World is full off. In his fifth year at Hogwarts, Harry is under pressure as the Ministry of Magic refuses to acknowledge the return of the evil Lord Voldemort branding him a liar. Meanwhile a delightfully evil new Defense Against the Dark Arts teacher is appointed by the Ministry and she turns Hogwarts into her own military state. Everybody was mix about this movie saying it wasn't that good and some other people have be saying this movie was okay, but I really enjoy it. Order of the Phoenix isn't a bad film, but it's a transitional one - a bridge between the wonder-filled childlike first few films and the darker territory of the later films. It's well-made and well-acted, but the plot is sometimes slow-moving and the exposition needed to translate the book to screen gets tiresome at times. Well I wouldn't call it a dud, but let it be known: Harry Potter and the Order of the Phoenix is easily the worst of the Potter films so far. Granted, this is still a very likeable and certainly recommendable production, but it's not as good as the first two Potter films, and not nearly as good as the second two. Cornelius, I implore you to see reason. Without a doubt, the most successful movie franchise of the Noughties are the adaptations of JK Rowlings Harry Potter books. The boy wizard has now enthralled audiences for over a decade and even has his own theme park. The films have significantly grown in stature over the years and Harry Potter, his friends and his enemies have grown up on screen. There has been little tinkering with the cast and formula and this has significantly helped to produce an entertaining and highly enjoyable series. No posts have been made on this movie yet. Be the first to start talking about Harry Potter and the Order of the Phoenix!